There are several good reasons as to why I think this is a *most* excellent release. First of all it's on Silent Season and as a label I think it's just about bang on the nail. Releasing small quantities of exciting music and purely for the love of it is something that I admire a great deal. It also has to be added that I'm thrilled to be working with Jamie on bringing these discs to Europe - I'm sure you can understand exactly why. 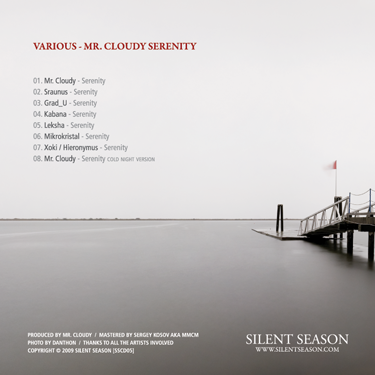 The second reason I think this is awesome is that it brings together a selection of relatively unknown (I stress relatively) artists from the net scene and gives them free reign to reinterpret Mr. Cloudy's deep and delicious original. The CD begins with his version and it's a totally stripped back slice of dub techno purity that rolls out in the finest style. Lovely chords and minimal rhythms collide to make a really well realised track that has mutant funk in abundance but remains reserved at all times. Class. Sraunus's offering takes it into more layered and dreamy territory with gorgeous Detroit-esque string melody elements and nary a beat in sight. It suits the original really nicely and provides a great counterpoint for the first track. Grad_U delivers an off-kilter version which sets out to make the rhythm bumpier and somehow unpredictable (even though essentially it's still a 4/4) but keeps the reduced tone to the chord structure. Fresh, long and utterly hypnotic. Kabana concentrates on expanding the chords into a more ethereal and static-laced vibe with acres of reverb and delay as well as added flourishes. The beat is totally reduced here and is there purely to stress the spaciousness of the atmospheres. Leksha's mix follows on from that perfectly by once again opening up the chords seemingly into a massive echo chamber whilst slowing the beats right down. It gives it a head-nodding flavour that remains true to the idea of dub all the way. Mikrokristal gives it a completely different feel by adding in an almost jazzy / Farben-style vibe. The original chord is intact but backed up by some seriously nice melodic chords and tones as well as a surprisingly funky rhythmic element. Unusual and really nicely done. Xoki Hieronomous provides the most overtly uptempo version with some subtle conga edits and a strong analogue bass tone. The rhythm is definitely a little punchier than the other tracks and it's got a more deliberately groovy feel. 100 dual slot recycled cd sleeves made from 20pt chipboard and contain 100% Recycled Fibers that FSC (Forest Stewardship Council) Certified. Each cd will be numbered and come with Silent Season stickers. If you have any questions or concerns about your order please email info@silentseason.com. Silent Season by www.silentseason.com is licensed under a Creative Commons Attribution-Noncommercial-No Derivative Works 2.5 Canada License. Based on a work at www.silentseason.com.